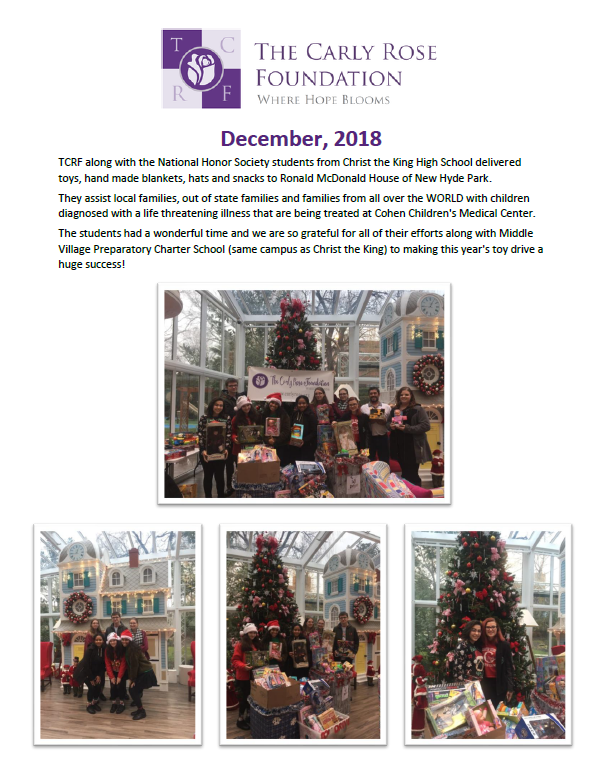 TCRF along with the National Honor Society students from Christ the King High School delivered toys, hand made blankets, hats and snacks to Ronald McDonald House of New Hyde Park. For full story click on link below. Mr. G from New York's PIX11 Network shares Carly's story of her fights with leukemia, and the Carly Rose Foundation's mission to help families with sick kids. So far this year, The Carly Rose Foundation has so far raised more than 150 pints of blood in partnership with New York Blood Center! After beating cancer twice, Carly Rose Nieves helped to give back to those who are still fighting during her foundation’s blood and bone marrow registry drive, held at Christ the King High School (CTK) in Middle Village. Carly Rose named Queens Person of the Week! Our latest Queens Person of the Week beat cancer twice and is making it her mission to help others do the same. Carly Rose Nieves, honoree and recipient of the New York Community Bank Inspiration Award, was recognized for her work at the Carly Rose Foundation. Most people would give up at the times when Carly Rose Nieves decided to keep fighting.